TURKEY VULTURE RECORDS » SATURDAY NOVEMBER 14TH, 2015 ACE COOK’S BIRTHDAY CELEBRATION FEATURING HATRIOT, POTENTIAL THREAT (S.F. ), ZOMBIE DEATH STENCH, MAD AT SAM, EYES OF MARA @ TOOT’S TAVERN IN CROCKETT, CA!!! 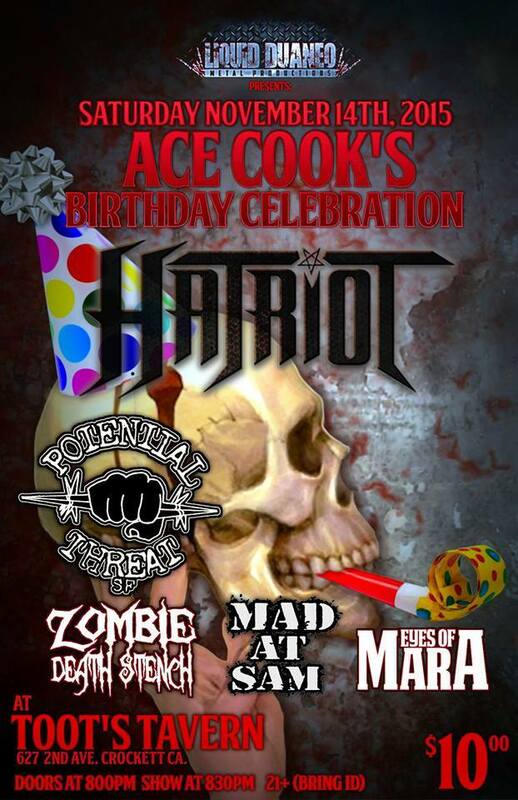 SATURDAY NOVEMBER 14TH, 2015 ACE COOK’S BIRTHDAY CELEBRATION FEATURING HATRIOT, POTENTIAL THREAT (S.F. ), ZOMBIE DEATH STENCH, MAD AT SAM, EYES OF MARA @ TOOT’S TAVERN IN CROCKETT, CA!!! October 14, 2015 | Posted in Music News | Comments Off on SATURDAY NOVEMBER 14TH, 2015 ACE COOK’S BIRTHDAY CELEBRATION FEATURING HATRIOT, POTENTIAL THREAT (S.F. ), ZOMBIE DEATH STENCH, MAD AT SAM, EYES OF MARA @ TOOT’S TAVERN IN CROCKETT, CA!! !